Starbucks is teaming up with Uber Eats to deliver coffee in six major U.S. cities, the coffee giant announced on Tuesday. Uber Eats will partner up with Starbucks Delivers, the coffee chain's delivery service, to offer on-the-go coffee to people in San Francisco, Boston, Chicago, Los Angeles, New York and Washington, DC. By the end of the rollout, Starbucks said, Uber Eats couriers will be able to pick up Starbucks products from one-quarter of the chain's U.S. stores, which amounts to about 3,500 branches. Starbucks, which shared this image when announcing its partnership with Uber Eats on Tuesday, said it came up with new "packaging solutions" to keep coffee hot during the delivery. Starbucks said the service would be available in seven US cities -- the six announced Tuesday and an unnamed seventh -- by this spring and would debut in London at a later date. A cyclist in central London working for Uber Eats, which delivers food and drink from 200,000 restaurants in 36 countries. "The partnership with Uber Eats brings together the fastest-growing meal-delivery service in the U.S. with one of the largest food and beverage retailers," Starbucks said on Tuesday. 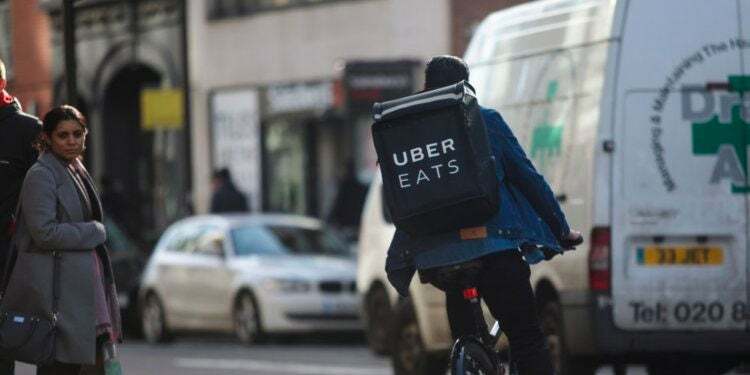 Uber Eats is the fastest-growing meal delivery service in the U.S., bringing in nearly as much new spending as industry leader Grubhub. Uber Eats' partnership with McDonald's has helped to propel the service forwards, and they will hope the Starbucks partnership has the same effect. In 2018's third quarter, Uber Eats accounted for $2.1 billion of overall gross bookings, and is growing at more than 150% annually.